“Oh no! Not knights’ moves again!” was our first reaction. Do we really have three days to spare? Sabre gave us our longest solve ever last year and we are still smarting. We set to anyway and peace was quickly restored as one lovely clue after another yielded its secret. AHAB went in first; ‘Captain of whaler a hardy seaman (4)’ producing A H(ard) + AB and an extra Y. FL (Liechtenstein) is just over at the other side of Switzerland (I even worked there once, in Malbun, a delightful little ski resort) and that fitted with ATTEST to give FLATTEST ‘Must even Liechtenstein give evidence (8)’, so we had an O and a U when MUST changed to MOST. The three different ways of producing extra letters gave Merlin lots of diverting ways to write clues and we thoroughly enjoyed solving this crossword. We must have been lucky, as the words YOU MAY KNOW quickly appeared and one numpty began to sing some song about ‘You may know by the clothes I wear that I’m a cowboy’. It was difficult to persuade him, even when ‘ALACRITY’ appeared in the down clue extra letters, that we were more likely to be in Shakespeare territory with a very famous huge knight. Having ‘You may know by my size that I have a kind of alacrity in sinking’ as the phrase was a great help, and, in usual numpty style, we worked backwards, easily spotting the source of the remaining extra letters and had a full grid with a distraught (anagrammed) FALSTAFF in the BUCKBASKET where the Merry Wives bestowed him before we took a break for dinner. No problems? Well not many. We liked the way the extra N could be produced by BAG around SKIN or BANG around SKI for BASKING in ‘Report about skin getting exposed to sun (7)’. As usual I learnt a sprinkling of new words, TAGLIONIS (coats indeed! They sound more like some exotic pasta), TEKTITE and the unusual LABILE, meaning ‘apt to change’. Of course I was reassured that Merlin shared the usual Listener setter oenophilia with ‘SmAll beer? Stop stocking fine cask (8)’ giving PIN in HALT – HALFPINT, and a ‘college drunk mentioned’ (to give Tech + tight = TEKTITE). Our only problem came when, after dinner, we decided to throw Falstaff into the River Thames and I became mildly troubled by the words of the preamble. We had to ‘replace him, yet more distraught … overwriting existing letters to make more new words’. It wasn’t difficult to see that LFAF/AFTS would convert ANGER to ANGEL, OTTERS to AFTERS, ENGRAINS to ENGRAFTS, SUMMON to SUMMAT and HAJI to HAFF, but what does OVERWRITING mean? Chambers offers alternatives. One can ‘superscribe’, ‘cover over with writing or other writing’, or ‘type over and replace (existing characters)’. It seems to be that there are two possibilities there. Do we leave the original characters visible underneath? Hmmm! It is so often the preambles rather than the actual solving that give cause for doubt. It seems to me that either way of resolving the problem would be justifiable so I shelved my doubts and we left Falstaff at the bottom of the river after about two hours of very enjoyable solving. Many thanks to Merlin. I started to read the title of this puzzle … Knight’s … and my heart began to sink. I continued … Move … and it completed its downward journey. And then the next two words … by Merlin … and it sank again! I think we all remember a certain knight’s move puzzle from last year, and I certainly remember Merlin’s Olde Treasure Hunt from 2006 (pre Listen With Others) which, if I remember correctly, had quite a low number of entries — none of which were mine. I breathed a sigh of relief as I read the preamble, since there was no mention of entries being in knight’s move order. Just the normal Merlin trickiness to battle with then. That, and having to juggle three clue types: those with a missing letter, those with an extra letter and those containing a misprint, none of which seem restricted to the definition part of their clues. 1ac started us off with an easy clue Captain of whaler, a hardy seaman (4) giving AHAB with the extra letter being the Y of ‘hardy’. I guessed that the extra letter clue type would be the easiest of the three types to decipher, given that they were probably the most difficult to disguise. Unfortunately, since there was no way of knowing which clue was of which type, or how many there would be of each, this proved to be of somewhat limited value. However, five of the first eight clues that I solved had an extra letter. Good clues all round from Merlin. 31ac Inside forward dare take one from old Liverpool footballer (6) had me panicking a bit since I know of very few current footballers, let alone old ones. Surprisingly, I had heard of Ian Rush, so INRUSH was OK in the end although the definition ‘inside forward dart‘ was a bit odd. I liked the simple 37ac Firmly fixes nut and acorns (8) leading to EN (nut, as in printing) + GRAINS ([a]corns). Despite holding me up the longest, my favourite was probably 36ac House may be inhabited by these initially wanting pads (6). Even knowing the answer, OTTERS (JOTTERS without its first letter), it took a long time for me to realise that ‘House’ became the river ‘Ouse’. Unfortunately, this was not in my 5th edition ODQ which surprised me. I decided not to search the internet just yet, but to work on the basis that the editors presumably thought this would not be too much of a hindrance. The endgame initially required that we find a “distraught protagonist” in the grid, presumably someone known for their size. Nobody seemed obvious in the rows or columns, so the spectre of a knight’s move path resurfaced in my head. In column 1, row 3; c2, r1; c3, r3; c4, r1 I spotted CHUB and I started thinking of Chubby Checker, Chubby Brown and Chubby Kaye. They got me nowhere. I also saw FLAB starting in 5ac and going down column 6, but that proved equally futile. After about 40 minutes of floundering around the grid, I was on the verge of resorting to the internet to find the source of the quotation. However, and don’t ask me why because I’ve forgotten, I decided to look in my older 3rd edition of the ODQ. There, under alacrity, was a pointer to our quotation – from The Merry Wives of Windsor. Four extracts above was an exchange between Falstaff and Ford, and Falstaff was a tad overweight, wasn’t he? Well, it didn’t take long to find him centrally placed, albeit jumbled as expected, in the middle of the top two rows. But where to move him to. The bottom two rows seemed likely, especially since the L could turn ANGER ino ANGEL. I soon saw THAMES in the row above, so that was definitely where he had to be relocated. In addition to ANGER becoming ANGEL, we had OTTERS/AFTERS, ENGRAINS/ENGRAFTS, SUMMON/SUMMAT and HAJI/HAFF. Finally the space that he had vacated was surrounded by BUCK-BASKET, which Chambers defines as a sort of old laundry basket, and is where Falstaff hid before being carried off and dumped in the Thames. A delightful puzzle from Merlin, and luckily not as difficult as his Olde Treasure Hunt. I was left with two mysteries. Why did the editors of the ODQ decide to cut the number of entries for the Merry Wives of Windsor from 16 in the 3rd edition to just 7 in the 5th? (Perhaps political correctness influenced them!) And why did the Listener editors not have any reference to the ODQ in the preamble? I made a note to invest in a new backup dictionary of quotations. Any suggestions, or would the latest edition of the ODQ have solved my problem? Numpties unlimited in action today! What do you do when you read ‘four words cryptically represented by the title’? You feed the title into an anagram solver! Well, we do. What does it come up with if you nourish it on ‘O Gather Twelve’? ‘Get over wealth’, ‘Elevate growth’ ‘Le Havre got wet’. Of course, we abandoned that line of thinking and wondered about the Twelve Tribes of Israel. That’s what the Internet gives you, as well as a poem about gathering roses, if you ask it where the words ‘O gather …’ originated. With the Twelve Tribes as our suspected culprit, we were somewhat put out when our calculations of clashing vowels began to produce strings of Cs, Js, Hs, Ls and Ks with a few Gs and Rs thrown in for good measure and not enough vowels to produce any words in a language that Augeas could conceivably be using. It hadn’t taken us long to work out the method of entry of words like PHILOLOGICAL (fortunately the first clue we solved, closely followed by other long words like SELFLESSNESS, LOGODAEDALUS and DODECANDROUS). It soon became clear that any vowel that was not a checked letter was going to be absent from the word play. Thus ‘Roped in place of seal, walrus finally reaches Land’s End’ gave us the simple word play LS (the abbreviation for Locus Sigilli – ‘in place of seal’) with (walru)S and the end of (lan)D and the other letters of LASSOED – all its vowels, were clashing with letters of the across clues. In the urge to solve, we tend to sometimes ignore the surface reading don’t we? How dastardly, though, of Augeas to have the poor walrus being towed all the way to Land’s End! Looking for surface readings, I couldn’t find any of the usual Listener setter dose of alcohol either – just ‘Forestall Mary over tea, not before’ (BV, the Blessed Virgin followed by TEA with the A disappearing – ‘not before’ = OBVIATE). However, looking back, I see that we were given a few hints by words like PHILOLOGICAL, IDIOLECTAL and LOGODAEDALUS – all words prompting us to hunt for something verbal. This was, for us, an original device – the wordplay having only parts of the clue and generally being composed of abbreviations and short forms. In places it was hard work to sort out what was being clued. What a clever clue we had in ‘DDT breakdown product followed by ban the bomb group and eminent scientists with a lot of stamina’. We put together DDE, CND and RS and wondered how that could produce anything to do with stamina. Oh the subtlety of it! Stamina – the plural of stamen. DODECANDROUS! This was a speedy grid fill and soon we had only one clue left to complete. ‘Men surrounding middle of Forum caught favourite of Romans’. This was a ‘give-away clue’ but we had to play silly games, putting every possible vowel, in turn, into a word-finder to produce MURAENA. To complete these weekly challenges, one does need a fair amount of the ‘General Knowledge’ that has been discussed this week on Derek’s message board in the context of interior angles of triangles. CARIBE, HACEK, MURAENA, PYEMIA: this week’s words to idly drop into dinner-table conversation! We highlighted and double checked those pairs of vowels and what they produced and stared at it. Could it be kings of some far-off country (a few James and Georges? ), books of some odd Bible version (Genesis, Kings, James, John, Leviticus? ), some odd form of Morse? In frustration, we slept on it and, of course, the light of day led to new lines of thinking. It had to have something to do with vowels and VOWEL appeared in the title when anagrammed (Go back to where you started, if you pass GO, do not collect £200!) The other letters gave THE GREAT, and obviously we had to ‘Shift’ the lot. THE GREAT VOWEL SHIFT. This was part of my university linguistics course. It must be age that is slowing down thinking processes! One can only admire Augeas for the hours that must have gone into creating this grid where all unchecked vowels were clashing. Thank you Augeas! This was the second Listener from the Augean stable (and, yes, I made the same pun in my blog about the first). That one, #4130 Rattle, was about Nancy Mitford and headless chickens, but there has been an Inquisitor since then, #1192 <Dancing Girl, where Augeas had a waltz with Matilda. Both were last year, so Augeas is a relatively new setter. Here we had clashes in 42 cells (about 30% of the grid), with the letter midway between the two being entered. Wordplay excluded the letters involved in clashing, but I didn’t know whether that would help or hinder. There was also a four-word theme to be entered under the diagram, and it looked like the Oxford Dictionary of English (which I do not possess) would be useful. I could see a visit to my local bookshop in Windsor being required. 1ac was easy … or at least it would have been if I hadn’t got ‘linguistics’ stuck in my head first. With that firmly planted there, PHILOLOGY wouldn’t come for another ten minutes. The first clue I actually solved wasn’t until 21ac Start of repeat broadcast which gave AIR, although I thought the subsidiary indication was the letter AR! However, 23ac DATA (si DT), 28ac WEIRDO (si WRD), 34ac ETUI (si ET) and 36ac DUOMO (si DM) had my inkling that it was vowels that clashed fully confirmed. A quick look at the title, and there was obviously VOWEL lurking there, but I didn’t pursue this any further. The down clues came quite fast, with 1dn PHYLA enabling me to get the alternative to ‘linguistics’ at 1ac. 5dn Ozzie greeting (no answer) daughter in gray — he’s smug and obsequious had me giggle to myself, with its wordplay of G’DAY – A + D in GY to give GOODY-GOODY. After only an hour and a half, I had finished the grid. No, that’s not quite right — after only an hour and a half, I had one clue left to solve, and that was 20dn Men surrounding middle of Forum caught favourite of Romans (7). This was • : R : • N : (where : were known to be vowels). It took me a further 15 minutes to move ‘caught’ from the wordplay to the definition part of the clue and get MURAENA (MEN about foRum), “a favourite food-fish of the Romans”. So, not a toughie, but a really enjoyable puzzle from Augeas. I liked the way that the wordplay didn’t always reflect just the consonants, but included vowels that were in unchecked squares, since no unchecked square ‘clashed’. I don’t know whether it was a tough grid for Augeas to fill, but it certainly seemed so to me. The unching was generous in a couple of places, and I suppose a clashing vowel could be described as a semi-unch! All that was left was to find the theme, almost certainly an anagram of the title. I was thankful that the preamble told us that the title was a cryptic representation of the theme, but I suspect that it would have been fairly easy to realise that, especially since ‘twelve’ couldn’t really relate to anything relevant. Despite thinking a trip to Windsor would be required to enjoy discovering it from a real book, my Encyclopaedia Britannica came to the rescue with THE GREAT VOWEL SHIFT. I was quite surprised that neither Chambers nor Brewer’s had any reference to it. I confess to never having heard of this late medieval change in pronunciation, so it was a pleasure to be enlightened. Google subsequently enabled me to read several fascinating resources, some of which had me making weird grunting sounds on and off over the following few days. Great fun … I can recommend it. At the last Listener dinner, I met Shirley properly for the first time when I presented her with the Bronze Casket after her table came first in the quiz held during the meal. On a variation of the “no such thing as a free lunch” principle, she then bent my ear about writing a setter’s blog when my next puzzle was published. I protested that anything I wrote would be a piece of fiction since my memory is pretty shaky and the development of one of my crosswords is a very haphazard process which I do not keep a record of. She is, however, a very persistent lady and, with my arm very firmly twisted, I have surrendered! So here goes…. I had been playing around with the idea of creating a puzzle incorporating colours for some time. My first thought was to remove the letters in the completed grid and replace them by colouring in each square using a code such as A = red, B = blue etc. The result might be a flag or a well known painting: this task proved totally beyond me. I then thought about the finished “picture” being an abstract one of my own creation: this would have proved a nightmare for John Green to check (although he always says that this should not be a deterrent to a setter) but I found that around 200 “pixels” (coloured squares) yielded a very mediocre artistic effort. At some point the idea jumped into my head of entering every answer as a colour so answers such as BARED could be read as “BA red” i.e. entered as BA and RED RUM would be treated as “red RUM” i.e. RUM. Now Machiavellian thoughts took over! I wanted to create the preamble from hell! Could it be a Carte Blanche, with answers having to be modified before entry and every intersection being a clash (i.e. a colour clash)? 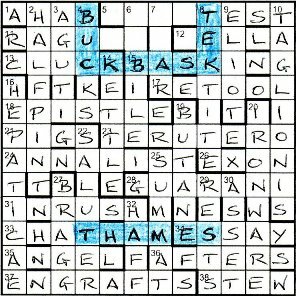 Perhaps the nature of this crossword could even permit every single square to be an intersecting clash. Now I had to start the hard slog of producing a grid which included creating my own “dictionary” e.g. L could be “defined” as LOR, LUMBER or BEIGEL (I found beigel very pleasing!). For a word to be deemed a colour, it had to be defined as such in Chambers. With the limited number of words available, I was not convinced that a grid could be found with the characteristics I was seeking and the first casualty was symmetry! Eventually I came to believe that a grid could be created and my thoughts turned to how the clashes could be resolved in a satisfying way. I thought of “any colour as long as it’s black” and then “black and blue”: after a while I had the title i.e. CONFUSED which with F = T (FIST) yield CONTUSED (black and blue). The use of Henry Ford’s quote determined an 8×9 grid with MODEL T FORD centrally placed. Starting from the perimeter but also working from the centre, a possible grid started to emerge: there were several false dawns — the most irritating being when intersections involved the same colour (i.e. no clash). The immense difficulty of creating such a grid enabled me to rationalise that the intersecting D of (BLUE) MURDER and (CYAN)IDE was indeed a clash albeit very marginally!! Tea Leaves has developed psycho tendencies. He seems to feel that “crossword” means an expletive to be sought from a frustrated solver! In this puzzle all answers are longer than the space allocated to them in the grid (which is unknown in any event due to the absence of bars). Having deduced the consistent method of entering the answers, it will be seen that in each square there is an intersection resulting from both an across and a down clue: unfortunately every single one is a clash!! All across clues contain an extra word. These words in clue order yield a message suggesting appropriate physical violence to be carried out by the solver. This should help in uncovering the puzzle’s motel theme and resolving the clashes. Clues are presented in conventional order. Numbers in brackets indicate the length of the answers before they are shortened. The completed grid should not contain any bars or numbers. The Chambers Dictionary (2008) is the primary reference although one answer is in Collins English Dictionary. The key element of this preamble which did not survive was a Psycho red herring. 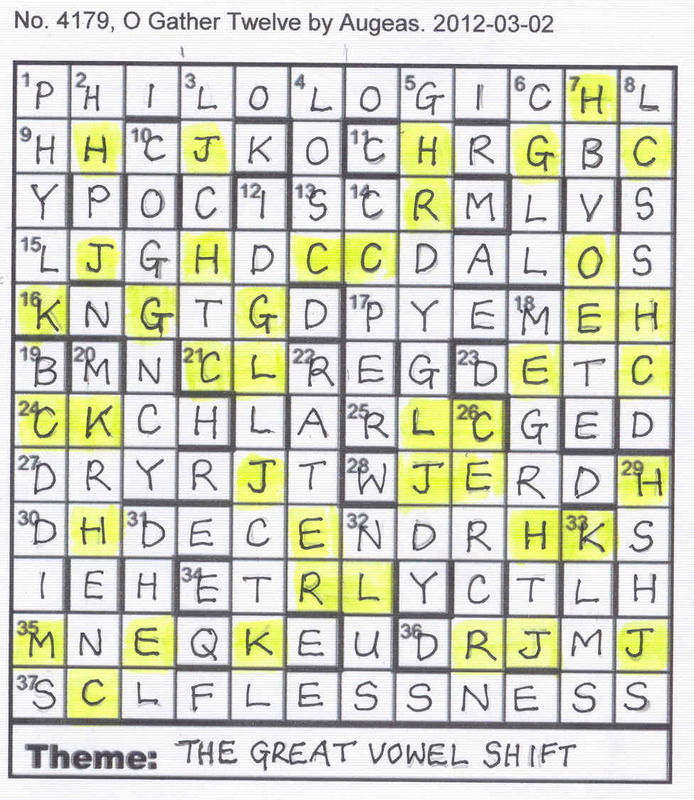 About five clues hinted at the film (a couple remained in the published crossword). “Motel” was a cryptic indicator of “Model T Ford”, the latter being read as “Model, T for D” i.e. Motel. The vetting process was delayed due to the tragic death of Derek Arthur and I awaited the feedback from the first vetter with bated breath. 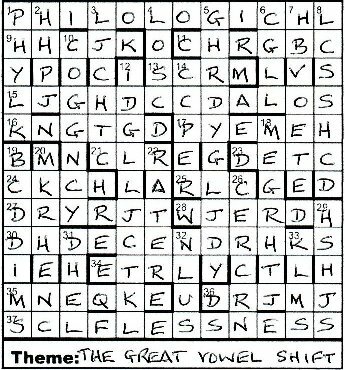 As expected, a number of clues needed to be rewritten (rigour is not my strong suit — I think my clueing is more suitable for The Guardian!) and the significance of motel was not spotted. It was, however, pointed out that my pseudonym could have been treated thematically i.e. TEA LEAVES = EAVES. I confess that I had totally missed this! Now we thought that the Psycho red herring could be strengthened by having a Hitchcock style signature hinted at. 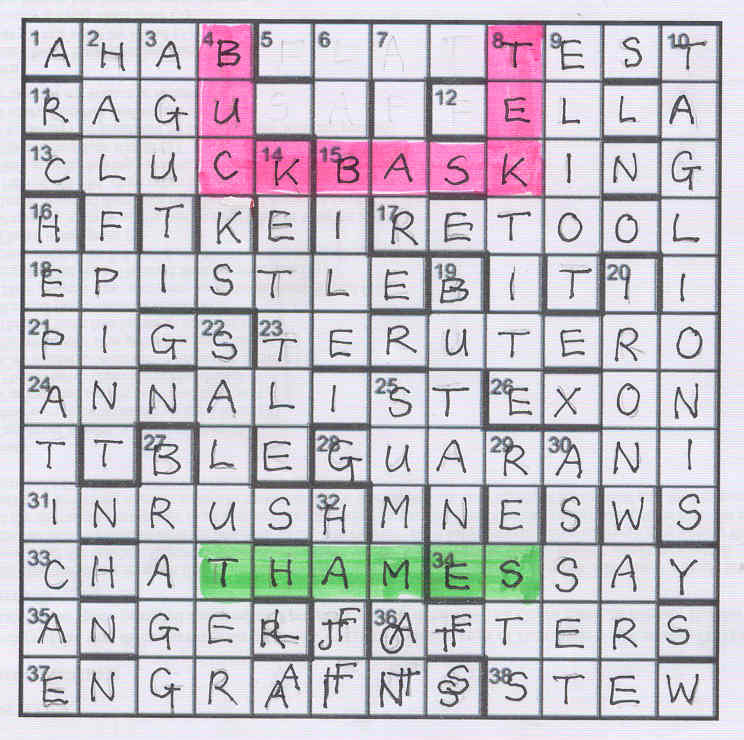 The second vetter solved the puzzle without recognising the significance of clashes — he merely omitted the colours in each answer. He was unhappy with the puzzle and concluded that the problem was with the red herring. Reluctantly I was persuaded to drop this feature. Some time was spent reworking the offending clues and, at the last gasp, we decided to offer the setter’s thematic signature as an “optional extra” — in case it was thought I had overlooked it (perish the thought!). As ever, I was indebted to the vetters who do a tremendous job: just how do you let a setter down gently when a “brilliant” idea does not quite work? !